A new year started. 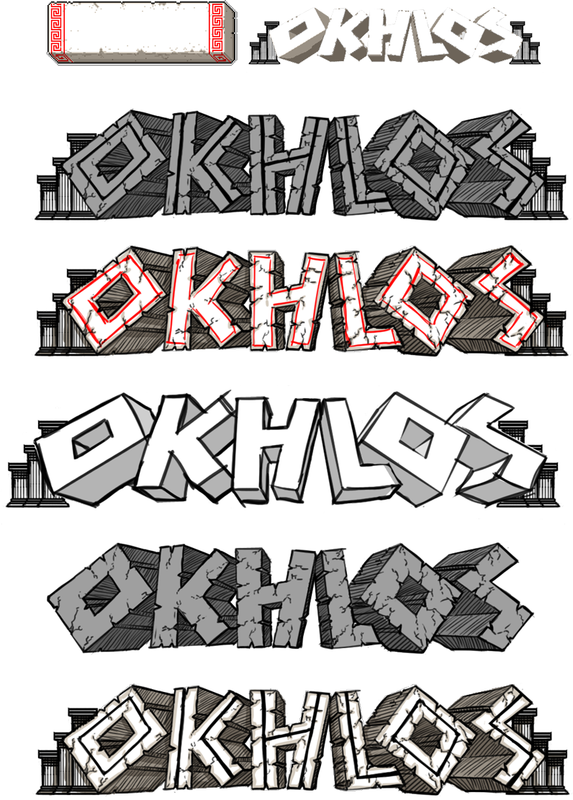 We can now talk about Okhlos’ development in terms of years. Many things happened throughout the first year of development, good and bad. While it usually is a good idea to recap the year we found it too cliche, so we did something else and took the time between last update and this to rest. The result was this update about a topic I usually hate: logos. Nowadays, designing a logo seems to be about following a series of strict steps. A lot of logos are very similar to each other. Looking at a small sample of logos, we can see the following characteristics. Broad strokes to make the title stand out. Some excellent designs came out from following these guidelines. Even Gravity Fleet didn’t escape from them (although that doesn’t make it a good example). But there have also been lots of logos that are very formulaic. Many of you know my background. I am an illustrator, not a graphic designer, so I have enough of an aesthetic sense to realize when something is wrong but it would be hard for me to find a way to fix it. So I end up fixing it by trial and error, which is both costly and tiring. 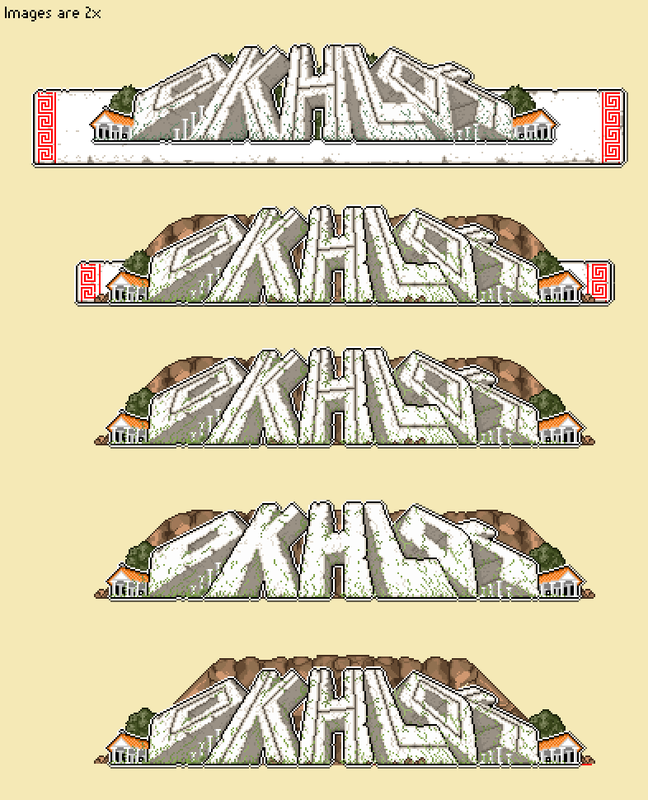 We have a mini-rule for a lot of our deicisions regarding Okhlos: doing the opposite of what we did with Gravity Fleet. Taking that into account, I decided to not priorize readability above everything else and focused on making the logo in a pixel art style that went along with the game’s aesthetic, at the same time making it a nice image by itself. I didn’t follow guidelines for design, readability, color contrast nor anything like that, simply an image that says “Okhlos” and that the splash suggested the game’s context. I started the most obvious way, by making stone letters. This is the first draft. Perspective, stones with some cracks and the design inside the letters that have a little Greek touch. The romboid-shaped “O” were something that I ended up taking from my research on different fonts. 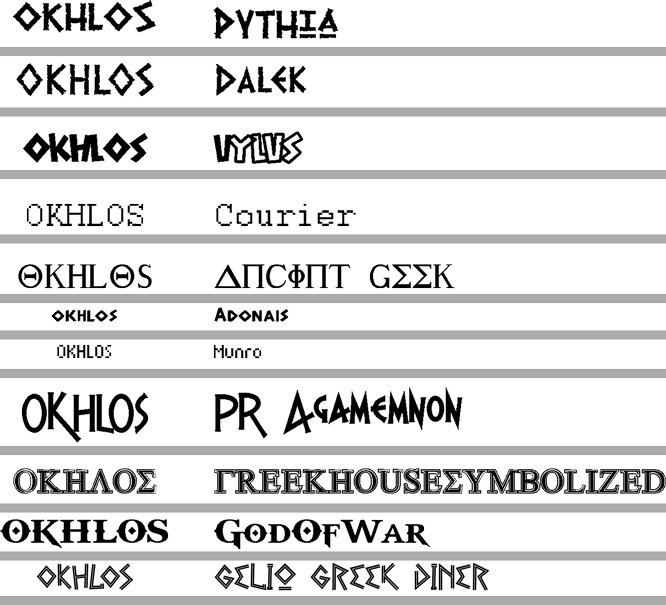 These are some of the fonts that I researched. From this list I took various characteristics that suggested Greece. Found the characteristics, I started scribbling different ideas about a more polished logo. With ornaments, styles and other embellishments. The problem with these approaches was that the letters , although they were made out of stone, didn’t have much weight. Somethign was missing. I decided to made the letters in 3D, change the font and play around with the camera to make it look like something stupidly huge seen from ground level. This brought me to this next version, which let me start the pixelation and gave me a clearer vision of what I was working to acomplish. To make the 3D I ran into a series of problems. Mi idea was to take my strokes from Illustrator to Max and work them there. They were horrible hours of trial and error, checking what could be imported into Max, because almost everything that I exported from Illustrator was rejected by Max. Finally I found a way to save an .ai as a Legacy (Version 8 ) and that solved my problems using Max to extrude the shapes from Illustrator. After that, it was all camera effects. This is how it looked on Max. The image above shows the first part of the work where I start drawing over the letters, separate them and correct some imperfection, etc. Once I have this as a base, I started pixelating this but at double the resolution I should, making me waste some hours. Finally, I ended up with the 3 options that I show next. 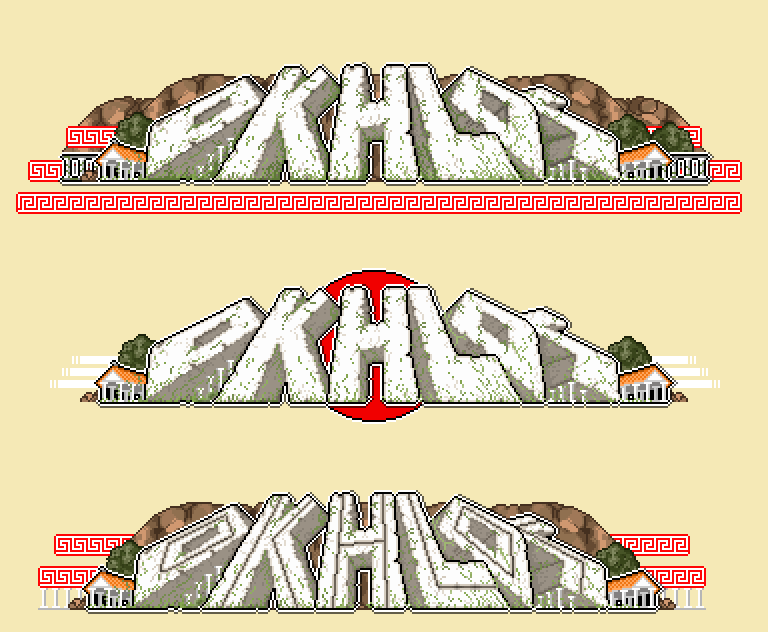 Although none of them are finale, they are close to what we believe could be a good logo/splash for Okhlos, always taking into account the idea that we want it to work more as an image than as a logo. I got inspired a bit on Norman Rockwell for the one with the red background, but both Sebastián and Cristian (Panchín, a designer friend that was giving me some tips about the logos) insisted that it suggested Japan way too much. I think it’s one of my favorites, from a completely aesthetic point of view. This one, after a lot of failed tries that I haven’t posted (from all the stages of design, there are a lot that I think should not be seen by humankind), is the one that had that illustration component that I was looking for. I cleaned up the rocks quite a bit, take off the lines (that in this case makes it more readable) and added a few city things in the background. Although I think that unfortunately we can’t close the chapter on logos, we are closer to what we are looking for. Any feedback is welcome! And yes, the name from the update it’s inspired by this song.